Goodreads says, "Humans and androids crowd the raucous streets of New Beijing. A deadly plague ravages the population. From space, a ruthless lunar people watch, waiting to make their move. No one knows that Earth’s fate hinges on one girl. Cinder, a gifted mechanic, is a cyborg. She’s a second-class citizen with a mysterious past, reviled by her stepmother and blamed for her stepsister’s illness. But when her life becomes intertwined with the handsome Prince Kai’s, she suddenly finds herself at the center of an intergalactic struggle, and a forbidden attraction. Caught between duty and freedom, loyalty and betrayal, she must uncover secrets about her past in order to protect her world’s future." It's many years after World War IV and a plague called letumosis runs rampant throughout Earth. Cinder is a gifted mechanic living in New Beijing along with a horrible woman who has "adopted" her and her two step-siblings. She only gets along with one step-sibling, Peony, who is kind heart. Cinder works hard as a mechanic and gives all of her money to her step-mother, while her other sisters spend the day trying on dresses for Prince Kai's ball. Normally everyone would attend the Prince's ball, but Cinder is a cyborg (second class citizen) and won't be going. Things start to pick up though once Prince Kai becomes one of Cinder's customers and (without giving away anything), Cinder is also linked to the palace's doctor who is trying to find a cure for letumosis. Marissa Meyer's retelling of Cinderella is utterly captivating and works well despite my initial hesitance. 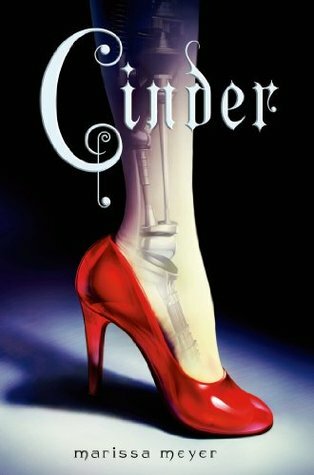 Cinder is one of those books that I wish I read when it first came out! Who doesn't love a spunky heroine? I was rooting for Cinder from the beginning. She's a really mysterious character, because the entire time you are wondering about her background. Readers know she was adopted, but we don't know anything about her birth parents or how she became a cyborg. Slowly, Meyer gives us clues and it really was a lot of fun! I think Meyer captured Cinderella's essence, while also giving Cinder some moxie. The setting of New Beijing after World War IV is pretty captivating as well in Cinder. Meyer did a great job building a world that was very Terminator-eque. I haven't read a sci-fi in quite sometime that really left me as absorbed as Cinder. I will admit that I was hesitant to start this series. When I read the synopsis, I thought to myself that a space-age Cinderella re-telling is going to be cheesy and won't work. Boy, was I wrong! Thankfully I listened to some of my favorite bloggers and gave Cinder a try. I am so glad I did. I can't wait to read Scarlet, book two in the Lunar Chronicles. If you love sci-fi, retellings that actually work and a strong heroine, then you will definitely want to check out this series if you haven't yet! WOO HOO!!!! I'm so glad you loved it Christina! I really loved Scarlet as well (Wolf!!!!) and Cress, and I still need to get to Winter but I know that will be amazing too. Looking forward to your thoughts on the next book! I am excited to read Scarlet next. Thanks again for sending me this book...definitely a new favorite. Thanks for dropping by, Jenny! I had the exact same reaction when I read the synopsis, but this series is so great! I agree, Kat! I definitely shouldn't have judged it by the synopsis. Thanks for visiting! I was hesitant about picking this one up too (I didn't like the cover and thought the sci-fi element wouldn't appeal to me) but I read so many positive reviews that I changed my mind and gave it a try. I'm glad you loved it too! Can't wait for you to meet Thorne, Cress, Scarlet, Wolf (I liked book 3 with Cress more than book 2) and Winter. I'm not a big fan of the cover either and I think that was part of the problem as well. I am glad I gave it a try as well. Looking forward to reading Scarlet! Thanks for visiting, Christina! I was rooting for Cinder from the beginning. She's a really mysterious character, because the entire time you are wondering about her background. Readers know she was adopted, but we don't know anything about her birth parents or how she became a cyborg. Slowly, Meyer gives us clues and it really was a lot of fun! I think Meyer captured Cinderella's essence, while also giving Cinder some moxie.